And they do it the only way that those sly minds at Google could do it: by rendering "Google" into a UPC symbol for the day! Scan here for more about the history of the ubiquitous barcode. 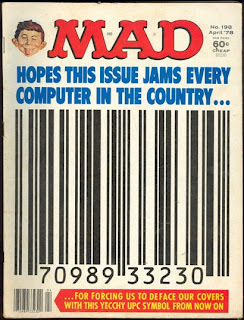 But of course, this day couldn't go by without a mention of what remains, more than thirty years later, the funniest/most spiteful UPC symbol of all time: the cover of MAD Magazine #198!